Kanenori was a student of the first generation Kitagawa Sôten (Munenori). He was from Hikone in Ômi Province. He worked around 1715-1750. Later he worked in Gojô in Kyoto and in Edo. His early work was in the style of the first Sôten master and while his later works show Sôten influence, his designs and subjects are more his own. He sometimes worked in shakudô nanako plate as did the first Sôten. His given name was Kaneishi. He seems to have left only one dated work and it is signed Kaneishi Nomura Kanenori and it is dated Kyôhô 9 Kinoe Tatsu Ôji (1724). The majority of the works signed with the name of this artist are forgeries. 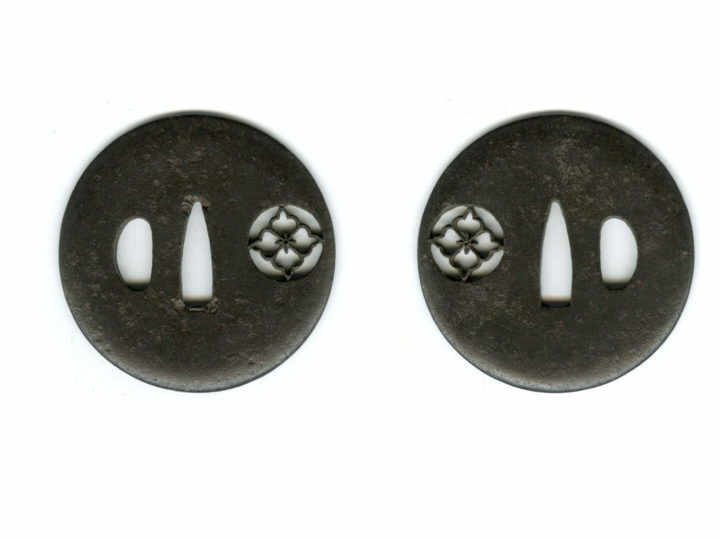 Designated Jûyô Tôsôgu (Sword Mount) at the 62nd shinsa held on the 18th of October, 2016. 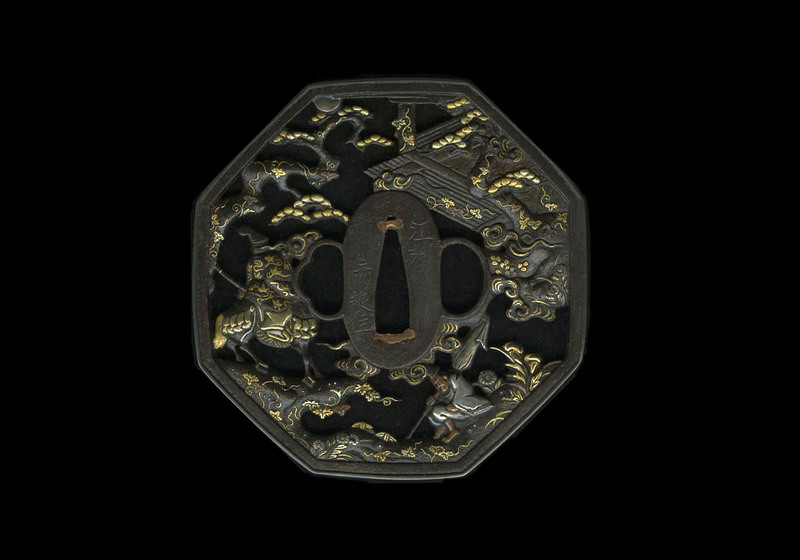 Item: Sukashi tsuba illustrating the story of Lady Kogô and Nakakuni from the Heike Monogatari, signed, Kaneishi, Nomura Kanenori sei; Gôshû Hikone jû (干英子, 野村包教製; 江州箱根住). Dimensions: Height: 9.5 cent. 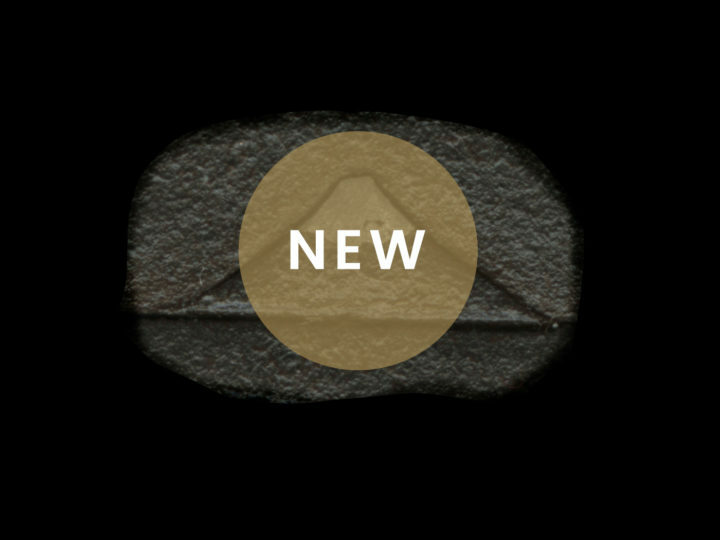 ; Width: 9.5 cent. ; Thickness at the Mimi: 0.5 cent. 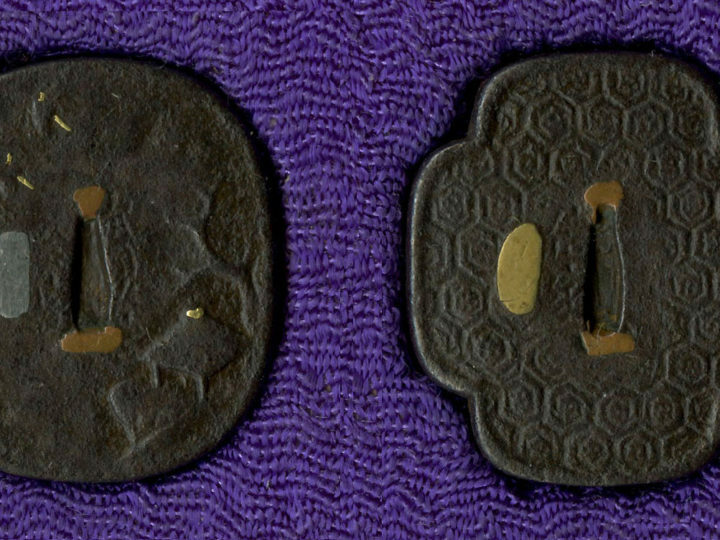 Description: Hakkaku-gata, iron ground, nikubori ji-sukashi (carved in the round with open work), gold, silver, shakudô and suaka inlays, shakudô fukurin mimi and two hitsu-ana. Period: Middle of the Edo period. Explanation: Regarding Nomura Kanenori, he was known as Saburôji (三郎次)) and Saburôbei (三郎兵衛) (or Saburôhyôe), and he used the pseudonym Kaneishi. Although he is said to have come from Hikone in the province of Ômi and to have resided in Edo, works with the inscription “Edo jû” have never been seen with all of his signatures having the accompanying inscription “Gôshû Hikone jû.” His style of workmanship is similar to that of the school of Sôheishi (藻柄子) (Munenori or Sôten), and he is in a branch that was influenced by this same school. The dates of his birth and death are not exactly known; however, it has been confirmed that there is a work dated “Kyôhô kyû kinoe tatsu” (1724), which allows us to know, for the most part, the period of his activity. 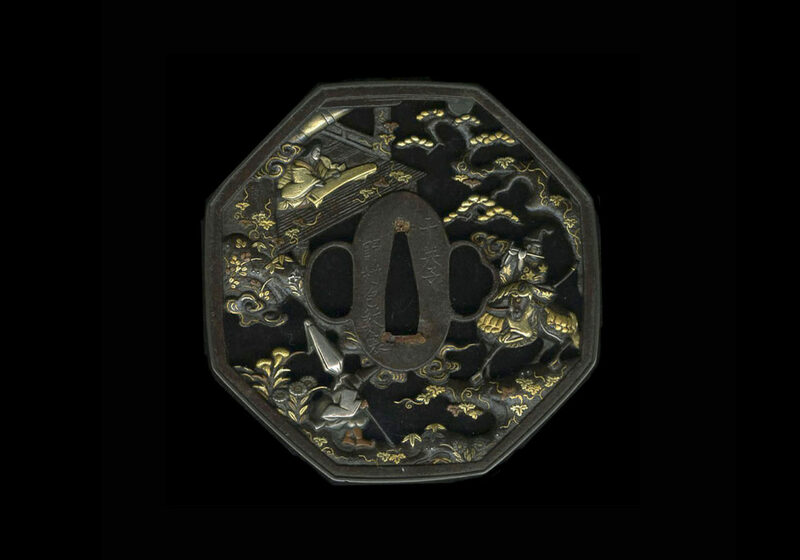 This tsuba depicts the beautiful and also sad story of Lady Kogô. Lady Kogô, who was a beauty and also a talented koto player, was the favorite of Emperor Takakura (1161-1181), which angered Taira Kiyomori (1118-1181), who had her driven from the Imperial Court. This work depicts the scene where the emperor’s confidant, Minamoto Nakakuni, answers the Lady Kogô in the evening during the middle of autumn in Sagano by playing his flute. The story is depicted using the entire surface of this magnificently large, hakkaku-gata tsuba. 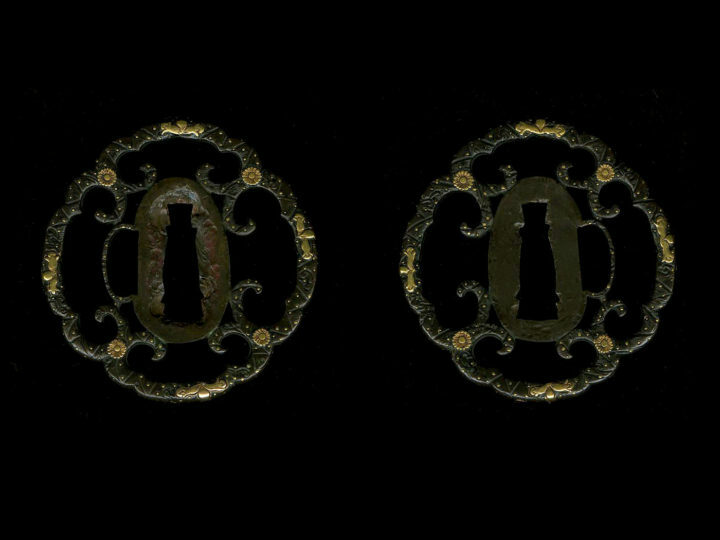 The boldly powerful composition and the delicate inlays with colored metal are splendid. No one less than Kanenori could exhibit such overflowing attractiveness. This is one of Kanenori’s most prominent works.